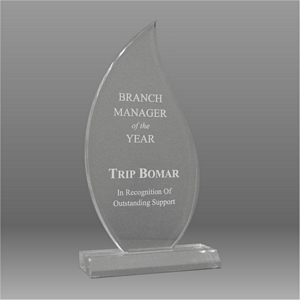 BFA-CN BEVELED FLAME ACRYLIC AWARD AVAILABLE IN 3 SIZES AND 3 COLORS, CLEAR, BLUE AND JADE. PLEASE CALL OR EMAIL FOR QUANTITY DISCOUNTS AND ENGRAVING QUOTES. AS A RULE OUR LASER ENGRAVING RUNS .30 PER LETTER IF THE PLATE HAS LESS THAN 100 LETTERS AND .27 PER LETTER IF THE PLATE HAS OVER 100 LETTERS. LOGOS RUN ON AVERAGE $6.00. THE FIRST PROOF IS DONE AT NO CHARGE. EACH ITEM WE ENGRAVE IS INDIVIDUALLY SIZED AND SPACED TO FIT THE PLATE IT IS ENGRAVED ON. WE DO NOT USE FORMS OR TEMPLATES. 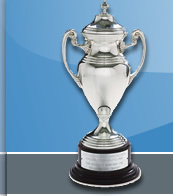 PLEASE INCLUDE THE ITEM PART NUMBER, QUANTITY, THE TEXT TO BE ENGRAVED AND THE DATE YOU NEED IT.